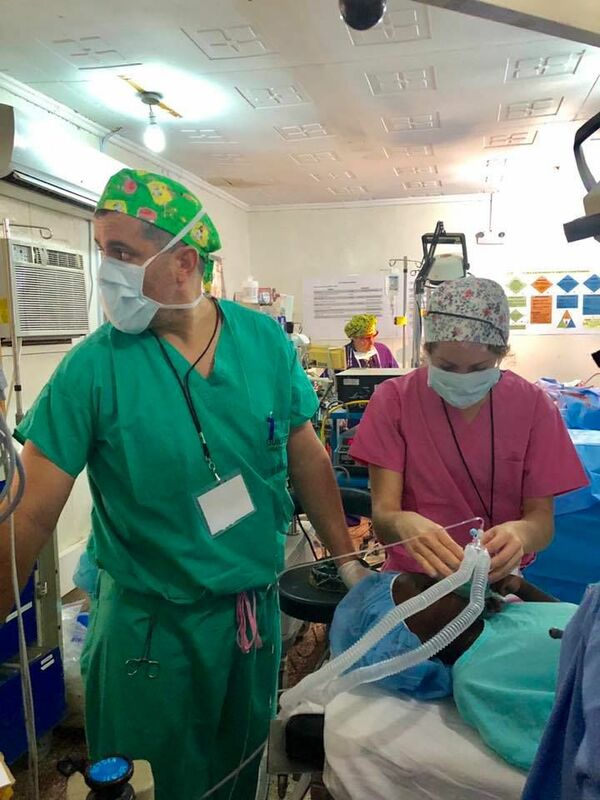 Jeff Scheidt (left), a Certified Registered Nurse Anesthetist, and his daughter, Megan, are shown in an operating room in a Kenyan hospital during a recent mission trip to the African country. Aquinas High School senior Megan Scheidt points to a hippopotamos during a recent mission trip to Kenya, Africa, that she took with her father, Jeff. Aquinas High School senior Megan Scheidt boarded a plane for Kenya with high expectations for a trip she eagerly awaited for most of her 17-year-old life. Those expectations were met, and then some. Scheidt, a member of the Aquinas girls basketball team, left for a mission trip to the African nation last month with her father, Jeff Scheidt, who is a Certified Registered Nurse Anesthetist at Vernon Regional Healthcare in Viroqua. Jeff had taken his other two children, Sam and Ryan, to mission trips in Africa, but none of the Scheidts had previously been to Kenya. This time, Jeff and Megan went to Kenya through a program appropriately called Kenya Relief. It was an 11-day trip to a community where Jeff was a part of 60-plus surgeries, and Megan was right there in the operating room with him, helping out however possible despite no medical experience. What she saw, what she learned, was eye-opening. “You know that everybody there is a lot less fortunate, and you have to give generosity all the time. But, they are way more generous than we are,” Megan said. Megan saw first-hand what her dad does, but in a different capacity since African operating rooms are vastly different than the one Jeff uses in Viroqua. Jeff compared the operating room in Kenya to those used in the 1930s-era in America. People would wait for hours — if not days — to be seen by the American doctors. For example, Jeff said there was a patient who traveled 700 kilometers (or about 435 miles) just to be seen by a doctor. The surgeries that Jeff was a part of ranged from minor surgeries to major ones, and the youngest person he treated was a 3-year-old. Appointments lasted anywhere from 10 minutes to four hours. The town also had an orphanage where Megan worked for the last few days. The two Wisconsinites were with a group of 20 people of all ages from around the country, but worked with three surgeons who graduated from the University of Wisconsin. “It was so cool to totally disconnect myself from life in America and all the luxuries that we take for granted here, and see like, a whole new culture in a different country for a week,” Megan said. Megan, an All-MVC second-team honoree for the Aquinas volleyball team this season, had waited for this trip since she was in third grade. She said it was hard to prepare for such a major trip, but once she was there, she found herself living out a lifelong dream. Megan found herself faced with a challenge she didn’t expect when returning to La Crosse, however. She had spent just two days with the Blugolds basketball team before leaving for Kenya, and that came shortly after the volleyball season ended. She had very little time to get up to speed with her unbeaten team — the defending Division 4 state champions — as well as her schoolwork. The Blugolds did fine without her, as they defeated Chippewa Falls to open the season in an impressive manner. But, Blugolds’ coach Dave Donarski wasn’t interested in bringing Megan back slowly. They needed her to play her role on a small, but talented roster. The Blugolds played with just nine girls in a victory over the Cardinals, and were preparing for a two-game invitational in Minneapolis against Minneapolis DeLaSalle and West Des Moines Dowling Catholic. Even though Megan admitted it took her about a week to get back into basketball shape, her presence often is felt on the basketball floor even if it doesn’t show up on the stat sheet. Megan admitted that there was a running trail she used in Africa and she sent Donarski a video of her running up and down the escalator at the airport. But, there was little time for workouts, as the group was up at 5 a.m. and went to bed at 11 p.m.
Megan has not decided on where she will attend college, and has gotten interest from area softball and volleyball programs. She was an All-MVC first-team center-fielder last spring.